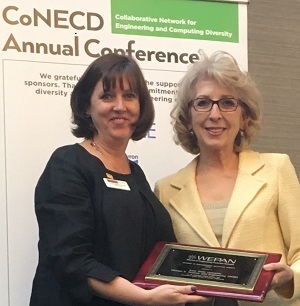 Recognizing Excellence - Women in Engineering ProActive Network, Inc.
WEPAN Awards honor key individuals, programs, and organizations for accomplishments that underscore WEPAN’s mission. Honorees demonstrate extraordinary service, significant achievement, model programs, and exemplary work environments that promote a culture of inclusion and the success of women in engineering. 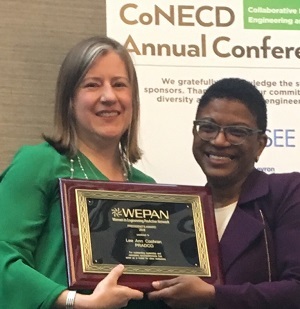 The 2018 WEPAN Awards were presented April 30th at the 2018 WEPAN Annual Conference in first annual Collaborative Network for Engineering and Computing Diversity (CoNECD) Conference in Crystal City, VA. June 14, 2016. To learn more about the criteria for each award, click on the award name. The Inclusive Culture and Equity Award honors an individual or group who has developed and implemented successful inclusive practices, policies or initiatives that promotes positive change with regard to the climate or culture for women in engineering fields at his/her institution. The Betty Vetter Award for Research recognizes notable achievement in research related to women in engineering. The award is named in memory of Betty M. Vetter, long time director of the Commission on Professionals in Science and Technology, who served as the first treasurer of WEPAN, Inc. and was a founding member of the Board of Directors. T he Women in Engineering Initiative Award recognizes an outstanding project or initiative that serves as a model for other institutions. WEPAN and the DiscoverE Foundation work together to recognize organizations and individuals for empowering girls with information about opportunities in engineering through the “Introduce a Girl to Engineering Day” initiative. The President's Award is given at the discretion of the WEPAN President. The 2016 award has been given to the mechanical engineering departments involved in the NSF-funded project TECAID, Transforming Engineering Culture to Advance Inclusion and Diversity, for their outstanding accomplishments. View past WEPAN Award winners here.